Groupon is a global leader in local commerce, making it easy for people to search and discover great businesses at unbeatable prices. They attract thousands of customers daily to their site to search or inquire about products, services and policies. To keep up with the growing demand of searches that could overtake their call center, Groupon needed an affordable solution that offered instant customer support. With Inbenta’s Semantic Search Engine and Self Service Features as a first line support for their customers, Groupon can answer far more of their support emails instantly. 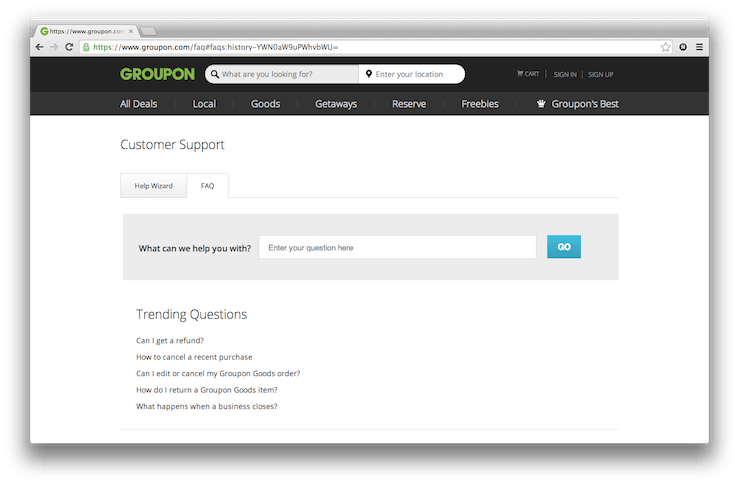 Using a Semantic Search box in their customer support page, their community can access Groupon’s Knowledge base easily to the find answers to all common questions. The Dynamic FAQs under the search box allow customers to quickly scan results based on its ability to understand the natural language of people. With Inbenta’s Semantic Search Engine, Groupon is able to offer over 1 million answers to its customers which decreased their email wait times and provided faster customer service. You can find Inbenta under Groupon’s Customer Support Page. To subscribe to Groupon emails or to search our marketplace of deals, visit www.groupon.com. To learn more about the company’s merchant solutions and how to work with Groupon, visit www.grouponworks.com.